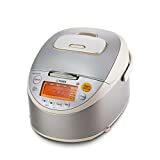 Have you been looking for a rice cooker to serve your guest deliciously cooked rice on their next visit? You must have been tired of cooking rice in those small and sticks pans or cookers and must have been searching for a decent replacement. Well, your search for a rice cooker ends right here. 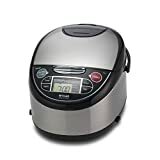 Whether you are looking to cook basmati rice, brown rice, jasmine rice or brown rice, here is a list of top 10 best rice cookers from Tiger which would solve all your purpose. 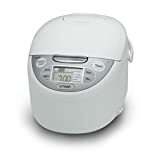 If you are looking for a compact and efficient rice cooker then this is the one that you should buy. With a capacity of 5.5 cups this model comes with a really cool feature – Keep Warm Function. It automatically switches to “Keep Warm” mode after the cooking is completed. You don’t need to worry about cooking the rice again if you get occupied with other household chores for a few minutes. Easy to use single button. Comes with retractable power cord. 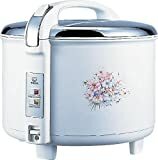 This rice cooker offers a really good and wonderful multipurpose cooking option. It comes with Synchro – Cooking function which helps you to cook rice in the inner pot and place a tacook cooking plate above the rice cooker. This helps you to prepare two dishes simultaneously and save your precious time and energy. The different modes on the settings menu offer you the option of selecting the kind of dish and the time duration for preparing the food. 4-in-1 function and 10 computerised cooking menu. Comes with cooking plate and a complimentary cookbook. Available in 2 sizes – 5.5 cups and 10 cups. If you have a particular eye for aesthetics than this is the perfect rice cooker for you. The white and grey colored rice cooker provides for a neat and elegant addition to your kitchen. It comes with 10 pre-defined computer settings that include Tacook, Porridge, and Quick Cooking options. Have you been looking for an all in one electrical appliance that assists you with multiple chores in the kitchen? Tiger’s JKT – S10U-K IH Rice Cooker is the answer to all your questions. It has the option of “Fermentation” and “Bake” which lets you make freshly baked bread for your dear ones in addition to cooking rice. It comes with Induction Heating which is both fast and energy efficient. Comes with detachable inner and outer lid. The beige and stainless steel body give it a versatile look an edge over other rice cookers. It comes with 3 layers inner cooking pan which can heat the rice to 265 degrees Fahrenheit and steam it at 240 degrees Fahrenheit. The advanced induction heating alternating electric current cooks the whole pot which ensures each grain of rice is fully cooked. 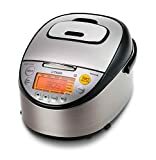 If you are looking for a rice cooker to cook rice for a large number of people or for commercial use than this is a brilliant option. It comes with steel grey colour body with black plastic handles and has a capacity of 20 cups. It delivers 40 cups of cooked rice from 20 cups of dry rice. One of the most affordable Rice Cooker with Micom technology Tiger’s JAX-R10U is best suited for your home use. The added Tacook option lets you cook another dish from the heat that is being used to cook the rice. This saves on both time and energy which you can utilise to watch your favourite soap! A beautiful gift for your wife, it is the most adorable cooking appliance that you could give her. It comes in floral white colour along with a printed flower. Detachable moisture collector ensures that the rice cooked is healthy and fresh. The retractable power cord is an icing on the cake and lends it the portability that everyone wishes for. One of the most advanced and new rice cooker from Tiger Corporation, it has set a benchmark for modern cooking. Stylish matt finished body gives it a compact and sleek look. 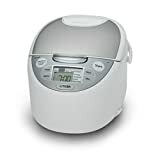 Use of advanced technology enables the rice cooker to heat the rice in just under fifteen minutes. 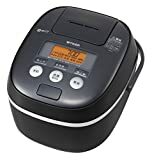 There is no doubt in the fact that this is one of the best rice cooker available in the market. Four buttons help you to select the kind of cooking settings you want. Apart from cooking every grain of rice to perfection, it is also very energy efficient. Multipurpose LCD displays the status of cooking and comes with customised Timer options. While there are several companies that manufacture Rice Cookers, Tiger Corporation is the leading brand in consumer electronics. These 10 rice cookers are ideal for your needs and is a must-have for your kitchen. They surely will make cooking rice easier.